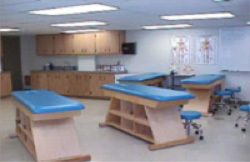 The Department of Kinesiology has a state-of-the-art learning environment for its athletic training program. 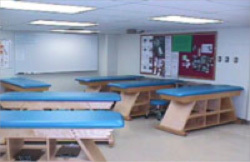 The Athletic Training Learning Laboratory lab, located in Gampel Pavilion, has been designed to mimic an athletic training room in form and function. It is only used for classes in the athletic training curriculum and enables our emphasis on hands-on learning during class, laboratory sessions, open lab times (for study groups and review sessions), and for certification examination test preparation.